The world’s smallest super wide dynamic range PL mount 4K digital film camera features cinematic Super 35 sized sensor with global shutter. Includes 12 stops of dynamic range, built in 4K RAW and ProRes SSD recorder, touch screen with metadata entry, strong machined aluminum chassis and more. Includes DaVinci Resolve software for a complete solution for shooting, editing, color correcting and finishing 4K digital film. The world’s smallest super wide dynamic range PL mount 2.5K digital film camera! Blackmagic Cinema Camera PL includes 13 stops of dynamic range, built in RAW and ProRes SSD recorder, 5 inch touch screen with metadata entry, extremely strong machined aluminum chassis and more. Includes full copy of DaVinci Resolve software for a complete solution for shooting, editing, color correcting and finishing digital film. 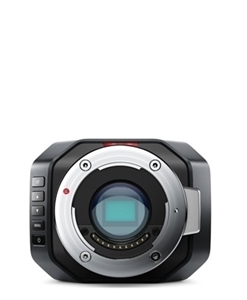 Features Super 16 size 1080HD sensor, 13 stops of Dynamic Range, MFT mount, SD recorder and display. Normal MSRP $995. Special price available until 31st August and subject to availability. The world’s most compact Super 16 digital film camera features an elegant magnesium alloy chassis, 13 stops of dynamic range, Super 16 sensor size, high quality Apple ProRes 422 (HQ) and lossless compressed CinemaDNG RAW recording, as well as interchangeable optics with an active Micro Four Thirds lens mount, all packed into an incredibly tiny size. Includes power supply, removable/rechargeable battery and wrist strap.